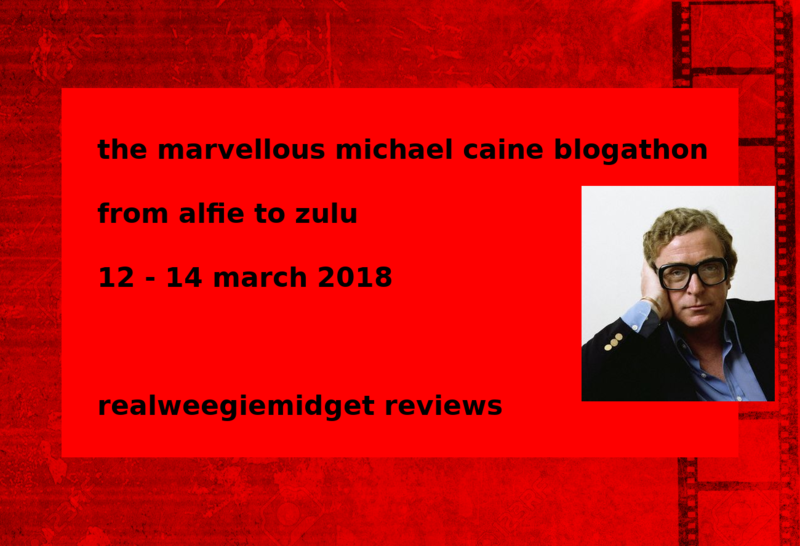 Celebrating it here on Realweegiemidget Reviews in the Marvellous Michael Caine Blogathon From Alfie to Zulu 2018. Michael Caine has been one of those actors I’ve grown up with since watching Surrender (1987) with my dad, to Interstellar (2014) and with my Darlin’ Husband. And those in between and after. He’s been the star of 115 films and counting, won 2 Oscars and been starring in movies for over 60 years. I’ve loved him in his romantic comedies with Sally Field and Michelle Pfieffer, his disaster movies with Richard Widmark and Richard Chamberlain and his war films with Larry Hagman and Sylvester Stallone. Leading me to announce this Cockney actor’s birthday blogathon. And despite the possibly misleading title of this blogathon, it’s covering all of his career to date including his voice work, cameos and life story. So as you’ll see as 2018 is approaching I’ve blogathons on my mind, and this is the first of possibly five that may happen next year (with 2 definite joint ones so far). 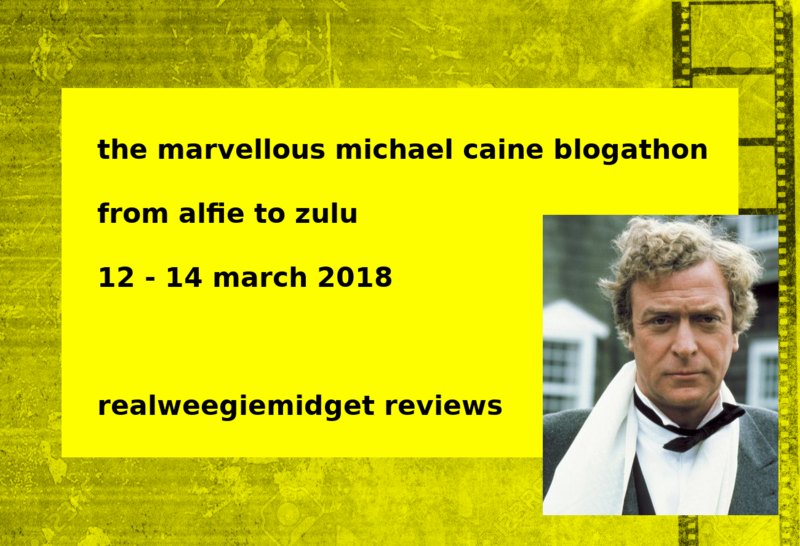 So as Caine is due to turn a spritely 85 next year, I’m tying in this blogathon with his birthday and running it from the 12th to 14th March 2018, the last day being Michael Caine’s birthday and a recap of all the posts after that. 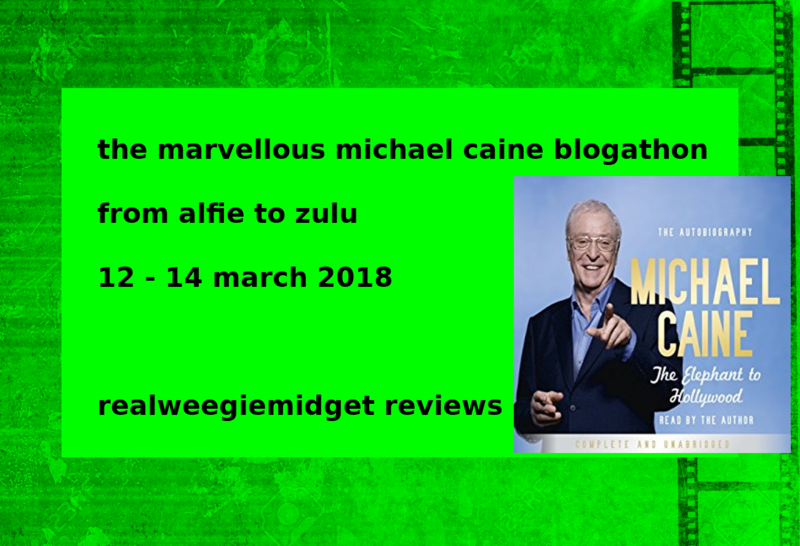 You can review ANY film or TV show starring Michael Caine, including cameos as long as you mention the part of the film with his cameo AND include a video clip or picture of it. Or if you want to review his books, that’s ok with me too. I will allow three duplicates for each topic be it movie, book or TV Show, but no more. I might be more lenient where books are to be reviewed as he hasn’t written as much. Review choices can be added as a comment on this page or you can contact me on my Contact Me page – either way please add the name and URL of your blog along with your choice of movie / book or TV choice. Or if you want to write about Caine, tell me what your topic will be. I won’t accept posts which are uncomplimentary or respectful to this man and his life and work. Add your Twitter or Facebook pages so I can promote your post. You can also add podcasts on his work but only if you send me the podcast link by my Contact Me page. A full list of blogs, podcasters and review choices will be posted on a separate page and updated regularly. A full list of Michael Caine’s movies can be found if you CLICK HERE. 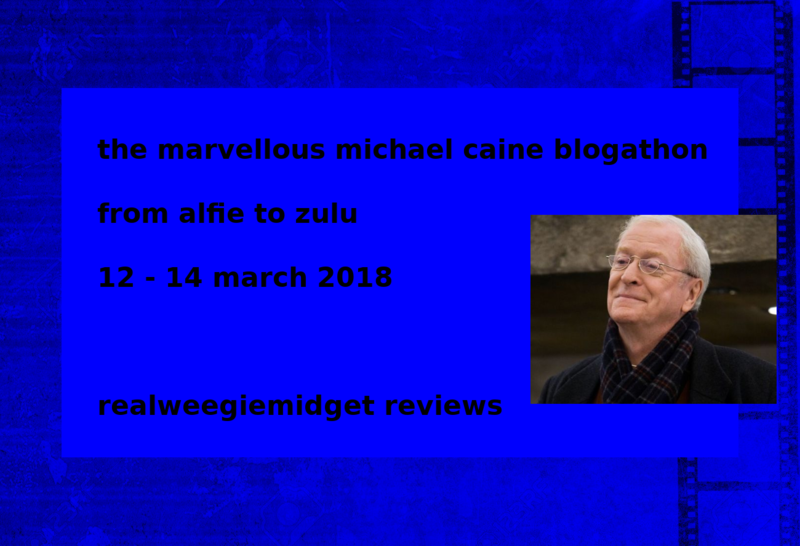 Realweegiemidget Reviews… 5 Michael Caine Mini Reviews (2005). And as the contributions are added you can read the choices taken so far HERE…. Look forward to hearing from you and remember you can join the fun at any time! Will add one a night as before! And impeccable timing as usual.. just adding all the posts now for tonight! Again, great timing.. just published my post and plugged yout post on Twitter and Facebook! Yeah, I saw that! Awesome. 3rd here, about 5th overall … but you’ve beaten the rush! Thanks, will add you to this evenings post. Hi Gill. Can I change my entry? Would I be able to write about “The Swarm” instead? Of course you can – looking forward to hearing your thoughts on it!! Thanks. I watched it for the first time last night, and thought that it’s an interesting one to look into. It is, especially with that cast too.. I reviewed it here, its in my Guilty Pleasures! I would like to right about Zulu for Old Hollywood Films. Thanks! No problem, will add you to the list now. Hey Gill. I’ve finally decided on my topic. I’ll go with “Alfie” thanks. I’ve never seen it, but I asked my Mum and she highly recommended it. Yay, superhappy you joining in, you will love it! Hi Gill, first day’s picks look great. Thanks will add you to tonights post! I’ve had an unopened copy of Educating Rita on my shelf for far too long. If it’s ok, I’ll add that one in to the celebrations. That would be lovely – its one of my many faves. Will add you to the blogathon, thanks for joining! Of course, no problem. Looking forward to it. Please put me down for The Ipcress File (1965). Will add you to the list – thanks for joining the fun. Emma – if you haven’t seen it you are in for a treat! Either way, this is that Michael Caine film that I hoped you would pick, can’t wait to read your thoughts on it! Count yourself in! I’d be worried if you picked anything else. The Eagle has Landed is a good choice – reviewed it myself – but this one so needs the EmmakWall treatment after that ace Mars Attacks post of yours. Would it be alright if I snag Gambit from 1966? Thanks for telling me about this! Certainly, love to know more on this one -thanks for joining. of course you can , will add you now. Can I write about The Italian Job, from 1969, please? brill choice, will add you now. Hey Gill! Happy New Year!! As per Ruth, I would also love to write about Sleuth (1972). It is probably in my top 10 favourite films. Such an acting masterclass!!! Thanks! lovely choice, will add you now, fab you joined. Happy New Year! fab choice and so glad you joining in. Fantastic. I will be tuning in. Love you to review this, as you say another great Michael Caine movie! Hi, please put me down for Dirty Rotten Scoundrels. No problem, superhappy you joining in Debbie! Since you are allowing up to three duplicates, I would like to do Miss Congeniality as well. I’m watching it now, and I forgot two things, a) that he was in it, and b) how good he is in it. My blog is Blog of the Darned, https://chrissturhann.blogspot.com/. Love you to do this, thanks for joining! Will add you to the list now. Oh I’ll definitely take part. I’m not sure which movie to choose but I’ll inform you soon. Great to have you on board as always Vinnie! Looking forward to hearing from you. I have chosen Half Moon Street for my entry. Looking forward to hearing about this, so happy you joining this blogathon! I am more than happy to take part. LOVE this. Michael Caine is the best. Since you’re accepting three duplicates, could I also do Deathtrap? Definitely, will add you now – love this movie so be good to hear different views of it. Cool – looking forward to hearing the final decision Rob. Certainly – not seen that film in ages and love to hear your views on it. OK with you if I take HANNAH AND HER SISTERS? Thanks for inviting me (again)! Happy hols to you too, will add you to the list now – great choice too! Could I write about The Wrong Box? My blog is Cinematic Scribblings: https://cinematicscribblings.wordpress.com/ Thanks! Love you too, so remember that movie and love to hear your take on it! Great to have you onboard, will add you to the list. Yay, thanks Dave – glad you joining in with one of my many faves of his! Certainly Rebecca will add you to the list now! Hi Gill. I am in! 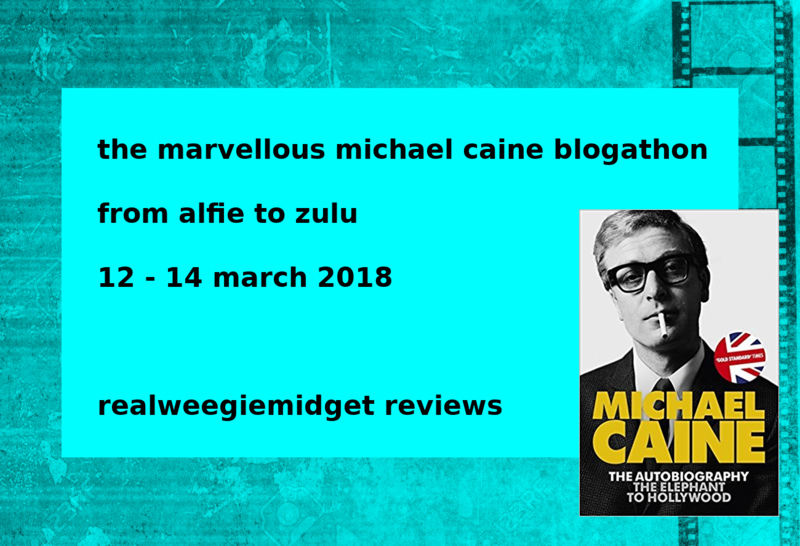 Love me some Michael Caine 🙂 I’d like to write about Zulu please. Thanks for joining Maddy and great choice – will add you now! Which Get Carter film are you going for the 2000 version or 1971 original?